Buying a violin can be expensive so you want to make sure that you are buying the best violin and best violin brand. You want to buy a violin from a company that is has a great reputation so that you know you are getting a high-quality violin. We’re here to share with you what violin brands we recommend so that you can be confident that you are buying one of the best violin brands. Our list of the best violin brands below is based on quality and affordability. It is intended to help you select a high-value violin brand that fits within your budget. If you’re looking for a thorough guide to violin brands for all levels, check out our full guide to the best violin brands. Every violin brand on this list may not suit your individual personality. You need to find a violin that sounds right to you and that you know you will play for a long time, but also fits in your budget. Most beginner violins cost somewhere between $100-$500, and the violin brands listed below are within that price range. Buying a musical instrument online is a fairly recent thing with the advent of the internet. If you don’t feel comfortable buying an instrument online, we recommend trying out violins at a local music shop before you shop online for the best deal. However, if you feel comfortable with Amazon’s return policy, you can certainly buy from them and return the violin if it doesn’t sound quite right. We have listed our favorite violin brands for beginners below. We’ll start with an overview of the best violins for beginner and then proceed into a description of each of the brands. Use this list as a guideline for which violin brands to buy. 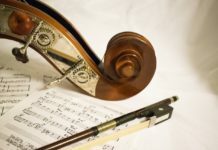 While not every violin brand on this list will fit your budget, experience level, or other search criteria, we hope it provides a great baseline to begin your search. 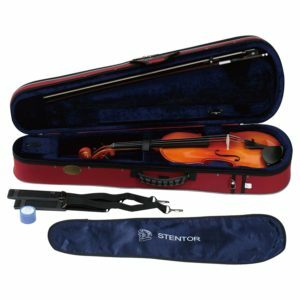 Stentor is a well-known stringed instrument brand and the best violin brand for beginners because they look and sound better than their price range. Mendini makes decent violins, but their most popular violin is the Mendini MV300 which costs less than $60. 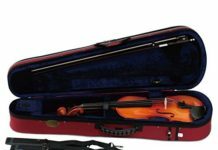 The Stentor violins are very affordable and have made a name for themselves by being one of the highest quality violin brands for the price. 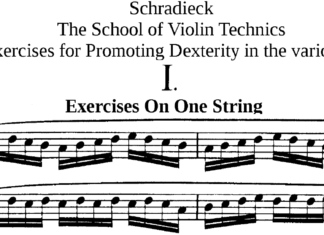 This is a great instrument to develop your violin skills one before moving on to an intermediate violin. Stentor is often recommended as one of the best violins for beginners. While these instruments are manufactured in Chinese workshops, Stentor checks each instrument in its United Kingdom warehouses for quality before delivery to your home or store. Stentor is sure to have the right violin for your student, from absolute beginner to slightly below intermediate. They come in a variety of sizes and are very sturdy, a plus for parents worried about durability while being transported to and from school. Like their other instruments, Stentor violins are made in the traditional way out of solid tone woods. This includes a solid ebony fingerboard (as opposed to the Cecilio above), pegs, and fittings with maple sides and back, and a spruce top. Stentor violins also have inlaid purfling to prevent the softer spruce wood top from splitting. Packages on Amazon include a violin bag, wood and horsehair bow (usually brazilwood), and rosin. 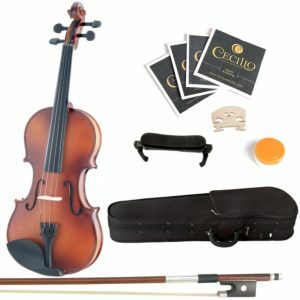 Cecilio is one of the most well-known student violin brand in the world. At a fraction of the cost of other big-name players, they produce quality beginner instruments that are all hand-made, even the less than $100 CVN-100. To learn more about the other Cecilio violins, read our guide on the best Cecilio violins. Cecilio violins are made out of hand-carved solid tonewoods in the traditional fashion: spruce top, flamed maple sides and back, and inlaid purfling. Their upper tier of student violins also feature well-defined flames. The main shortcoming of Cecilio violins is that their fingerboards are made of maple instead of ebony. Ebony fingerboards are sturdier than maple since ebony is a hardwood which means ebony fingerboards can withstand the repeated pressure of fingers tapping on them. Of course, removing the ebony fingerboards makes for a lower-cost violin, but you may need to take your violin in for repairs more often. These violin outfits are also very generous. Most Cecilio outfits come with a quality brazilwood bow with unbleached Mongolian horsehair. They also come with boxwood pegs, tailpiece (with four fine tuners), and both a soft and hard case! Great value for your money. 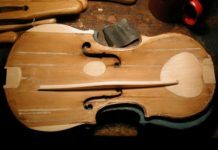 Knilling violins are well-known by teachers and students alike for making high-quality student violins. 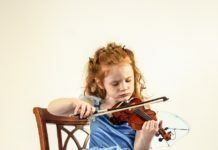 While Knilling violins are certainly not the cheapest option for a beginner violin, they are great instruments if your student is serious about playing the violin. A unique feature of the Knilling violins is what is known as Perfection Pegs®. 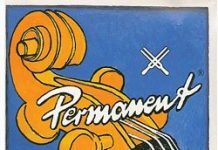 Knilling makes pegs that “feature gears within the peg shank that allow for precise, painless tuning.” This is a great option for younger students who have trouble turning traditional pegs while tuning. Based in St. Louis since 1922, Knilling violins inspects every instrument before shipping so you can be sure that you are getting a great violin. Kennedy Violins, a Washington state-based violin maker, is an up-and-coming luthier in the space. Their violins range from beginner to intermediate, but their beginner violins are some of the highest-rated violins on Amazon. The Louis Carpini G2 violin is our favorite. 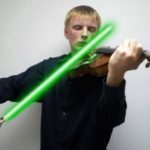 It has glowing reviews and is a great violin for beginners. It is handcrafted with solid maple and spruce tonewoods and comes with everything you need from a violin kit. 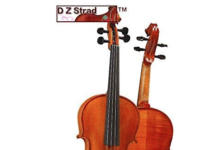 This brand is also worth looking into if you are looking for a high-quality intermediate violin when you’re ready to upgrade. Cremona violins make great beginner instruments for a decent price tag. While the parts are made in China, Cremona violins are assembled in California, so there is definitely American craftsmanship involved. Made out of select tone woods, such as hand-carved maple, spruce, and ebony, these violins perform pretty well as-is, but can sound a lot better with minor improvements. Out-of-the-box, Cremona violins come with Prelude strings which are okay, but swapping them out for a higher-quality violin string brand can make a world of difference. 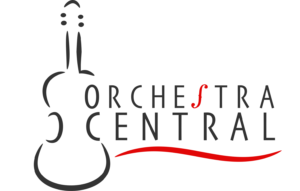 Cremona violins are built to MENC standards (National Standards for Music Education as prescribed by the Music Educators National Conference in 1994) in their Cremona workshop in the state of California. The MENC standard ensures that they are playable when they arrive, and can be easily integrated into your child’s school orchestra or ensemble. It’s no wonder that students and teachers alike favor Cremona over other student violin outfits. Each outfit comes with a high-quality Brazilwood bow, a Cremona bridge, a violin bag, and a Breton composite tailpiece with 4 built-in fine tuners. Medini makes great budget violins that work great for younger beginners. These instruments are not very durable and the sound quality isn’t great, but if you’re looking for an instrument to quickly assess whether your student will continue playing, a Medini violin will be a good way to not commit a lot of money. Most of these instruments are factory made which allows them to sell at such a low price. You will probably need to replace the strings that come with the violin with something slightly higher quality such as Prelude violin strings. While most of the violin brands above come with everything you need to get started, some of the packages don’t come with everything you need. Violins need the following basic accessories such as rosin, a case, a bow, etc.